The car which went on fire on the A835 near the Conon Bridge junction. 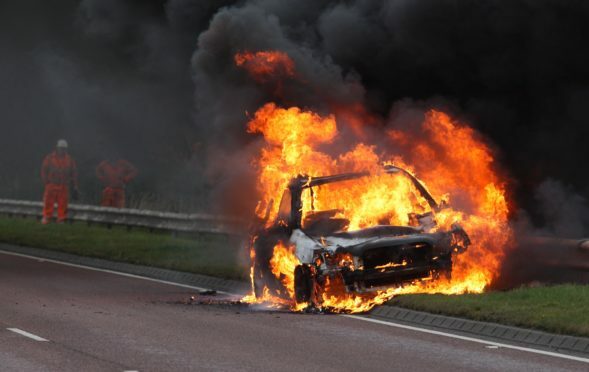 Fire crews rushed to a Highland roundabout after a car burst into flames earlier today. It happened near the Maryburgh roundabout at around 11.45am. No injuries were reported. The fire service used two hose reel jets and two sets of breathing apparatus to extinguish the flames. The vehicle involved was a Subaru which was heading south between Maryburgh roundabout and Tore roundabout on the A835 near Conon Bridge junction. Police were also made aware of the incident.